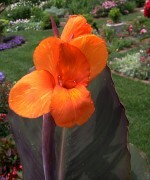 Canna hybrids are the most commonly grown garden plants. They are herbaceous perennials in the Cannaceae family that is most closely related to ginger, banana, and bird of paradise. The parentage of the hybrids includes C. glauca, C. speciosa, C. iridifolia, C. warscewiczii, and C. flaccida. The result of various crosses has produced numerous cultivars that vary most significantly in height, foliage color, and flower color. Height varies from 1.5′ to 9′, leaf color from green to bronze, purplish and variegated, and flower color from red, to yellow, cream, orange and pink. Cannas are excellent plants for the border although in most climates they have to be lifted after the first frost and stored for the winter. They are good in containers and add a tropical look any garden or patio. The genus name Canna comes from the Greek word kanna meaning reed. The specific epithet generalis is the Latin word for normal; hortensis is the Latin word meaning pertaining to the garden. See below for a list of some of some of the outstanding cultivars. 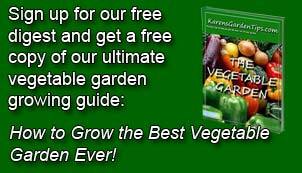 Soil: Fertile, consistently moist, well-rained, although some cultivars tolerate more water than other.